iPads are everywhere, at least around these parts. And they’re starting to pop up in a lot of offices, too, with a good share of SMBs willing to take the plunge. With these sleek, connected tablets in hand, you’d think you would no longer need to lug around printouts of spreadsheets, memos and other documents. The printer’s days have to be numbered, right? Office workers still pile into conference rooms clutching file folders, notepads and rumpled printouts. Here are three reasons why, in no particular order. It’s certainly serviceable for web browsing, replying to emails and watching videos. But for intricate design and technical work — where layouts demand per-pixel perfection — it falls short. Even mundane office docs would benefit from crisper text and graphs. Before you roll your eyes at doodling, watch this TED talk by Sunni Brown. Then come back. Yes, there are doodling apps and you can buy a stylus for the iPad, but drawing on its screen is not a baked-in experience for iOS. What do I do with paper handouts and memos? I doodle big fat arrows that point to salient sections. You might see cartoonish missiles aimed at crappy ideas while inky lassos encircle breakthrough concepts, raising a protective forcefield. The point is that the iPad does a poor job of helping doodlers organize and remix data. It’s time for Apple to fully embrace the stylus. 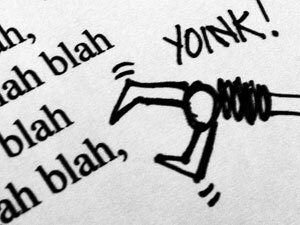 Touch is great, but it’s a blunt instrument for folks that like to doodle in the margins. Microsoft’s Courier concept hinted at this quasi-analog approach of interacting with data and digital media. Alas, it was unceremoniously scrapped. You know what I rarely do anymore? Buy paper magazines and newspapers. That’s because Flipboard (plus Longform) collects my favorite content and displays it beautifully for effortless consumption and sharing. It’s a pity more businesses don’t adopt this model for their internal communications. It would sure help breathe new life into those sad intranets and company blogs that have sprouted up like weeds at many companies. Do you want to know why your employees are disengaged; don’t know when flu shot day is; or one division doesn’t know what the other’s doing? It’s because they’re already drowning in emails. Then you’re shocked when they ignore yours or didn’t check your company’s portal. So someone fires up the printers and distributes — or worse, physically mails — that “important” memo that ends up tacked to the cubicle partition. Efficient? Nope. Social? Definitely not. 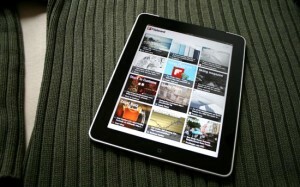 So why not push that content to them on their iPads with a dedicated app? Let them quickly get caught up on what’s pressing and then explore and share their thoughts about the parts of your business that appeal to them. It’s an elegant way of building momentum for the latest initiatives and great new ideas that are brewing at your company. Who knows, folks in another department or clear across the country might have some awesome ideas of their own to contribute. It could also spark some better collaboration and expose talent that you didn’t even know you had on your payroll.